Cup Inside Diameter: 2 9/16"
Cup Inside Height: 2 9/16"
The Paul Fox Chick Cup is among the first 20th century cups designed for street and stage performers. These terrific cups were named for the fact that the cups were required to be big and heavy enough to prevent a small baby chick from moving or tipping over the cups when they were concealed beneath them. To date, these cups still remain a popular and sought after style of cups for the cups and balls performer and collector. 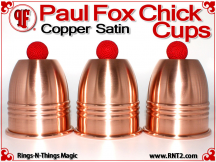 The Paul Fox Chick Cup design is a TALL cup, but a wide mouth cup. The height of the cup is so impressive that when you park your final loads on top of the cups it makes a wonderfully elevated display. When originated, the cup design was groundbreaking in that it featured a curved transition from the beads to the saddle that tall straight-walled tapered cups didn't have at the time. Three center beads accent the cup, forming the skirt and give the cup an elegant look. The attic space is huge. Since its original conception and manufacture, many magicians have declared their appreciation and preference for this set of cups, but alas because the cup has been so rarely produced in recent years, most sets in existence sit unused in collections. Cup Inside Diameter: 3 1/4"
Cup Inside Height: 3 3/4"
One of the most popular and sought after style of cups for the cups and balls is the Paul Fox style cup. The Paul Fox cup design was among the first cup created exclusively for cups and balls performers that featured a rounded top. Since its conception and manufacture, many magicians have contributed moves to the performance of cups and balls that can best be accomplished with a rounded top cup. 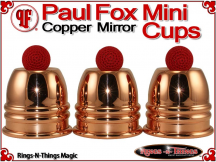 Now the famous Paul Fox design is available in this miniature replica set, allowing the cups and balls performer to bring a small set of cups to any venue and include a performance of the cups and balls in the most "close up" of situations. Cup Inside Height: 1 7/8"
We feel it is important to mention that two different size balls can be used with these cups depending upon your needs. 7/8" diameter balls CAN be used, which gives you a larger ball to manipulate and better performance of some standard moves and sleights with the cups, but you cannot nest three 7/8" balls between the cups. If you need to nest 3 balls between the cups then you will have to use 3/4" balls. We prefer to use the larger 7/8" balls, you may prefer otherwise. Both are listed here for your convenience. 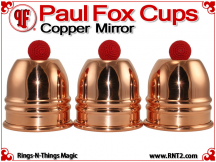 Paul Fox Mini Combo Cups! At long last these cups are now available for close up performers who desire the strength of a mini combo set of cups with one gaffed cup. One of the most popular and sought after style of cups for the cups and balls is the Paul Fox style cup. The Paul Fox cup design was among the first cup created exclusively for cups and balls performers that featured a rounded top. Since its conception and manufacture, many magicians have contributed moves to the performance of cups and balls that can best be accomplished with a rounded top cup. 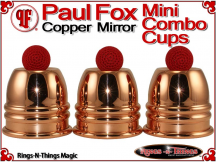 Now the famous Paul Fox design is available in this miniature replica set, allowing the cups and balls performer to bring a small set of cups to any venue and include a performance of the cups and balls in the most "close up" of situations. They are a delight to hold in the hand. They handle superbly, and can do all the moves that full size combo cups can do. Included with each set is a Mini Shot Glass. This small glass fits under the cups and allows you to do routines with the Ron Wilson segment, that was made popular by Larry Jennings, where a shot glass and handkerchief are used to cause a ball to penetrate the handkerchief and appear inside the shot glass. The Mini Shot Glass is approximately 1 7/8" tall, holds 3/4 oz of liquid and fits comfortably under the cup. It's not plastic, it's real glass. Cup Inside Height: 1 13/16"
We hope this page has been informational and assists you in appreciating the legacy of the Paul Fox Cups design for cups and balls.